F O R E ! There’s a saying in golf that refers to those precious few seconds after you strike the ball and it’s called “admiring your shot”. This happens for two main reasons: to enjoy the fact you nailed it or to insure you know whether it went into the sand trap or the woods. Mine is usually the latter. Do we ever have a chance to admire our shot or enjoy the victory? The answer is usually akin to the amount of time it takes to make a cup of coffee or tie one’s shoes. There is rarely time to stop and assess whether a new idea will work, has worked or can be slightly revised. The result is a c.y.a. atmosphere where new ideas are shelved along with opinions and the dream of co-creative teamwork. Head down. Arm straight. Clear your mind. 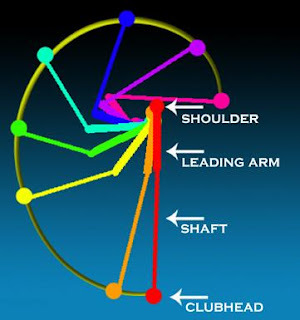 There are about twenty things you need to do correctly in order to perfect the golf swing. Any one of them could be the reason you’re taking another penalty shot. Like with everything we do, the difference is all in our minds. But somehow in business we are expected to deliver the most cost-effective, bottom line growing, revenue generating, guaranteed winning, competition killing idea - every time. Save or make money, the rest is irrelevant. 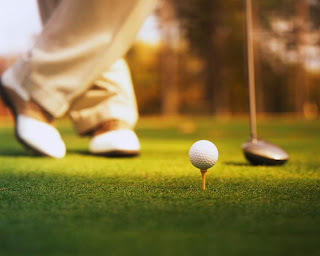 But in golf, if your concentration is solely on making the putt you will miss it every time. Exploration, experimentation and the openness for new ideas is a cornerstone of business. Do you have that type of atmosphere at work? If you own your own business, do you employ that attitude with all that you do? Or do you lay up because it would be too dangerous to shoot for the green this time?